Hoorah! 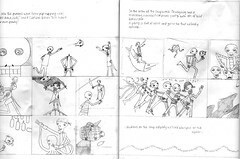 I’ve sent the first set of roughs off to be looked at by the publisher and await discussions.. 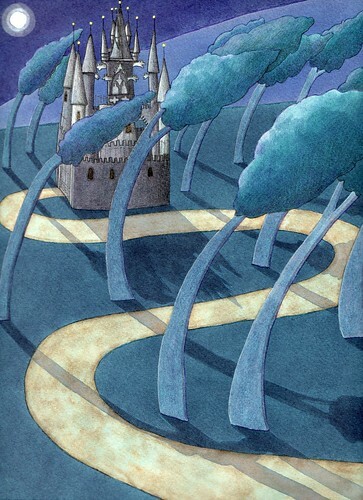 Meanwhile I had to send my agent (Eunice McMullen) some scans of colour work from my portfolio and it was good to see some of it again, after a long time. It always looks better after not looking at it for quite some time! So here’s a few, they are mainly vignettes or single pages and from a variety of books. This is from ‘Wanted! 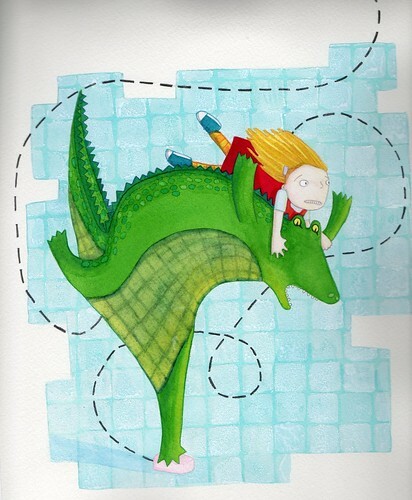 Have you seen this alligator?’. My first book and still probably one of my favourites. I was given a lot of freedom artistically and I think it shows in the artwork. Here is Alberto slipping on a bar of soap with Tina. ‘Pedro the Brave’. 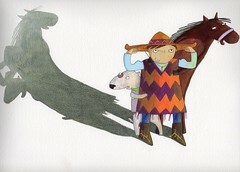 This is on the title page and shows Pedro and Dusty and Ronnie the Horse. I do love a shadow! The opening page of ‘Theres no such thing as a ghostie!’ A scene setter and quite a different one for me to have such a limited palette. Thanks for all the lovely comments, most encouraging. Here are some more of the roughs I have been working on. I am nearing the end of the first set of roughs, which might make it seem like I’ve done them really quickly. Its actually taken ages, I only work part-time (being a mum too) and this has been such a tricky project to work on. Tons of research and its all been a bit stop-starty. 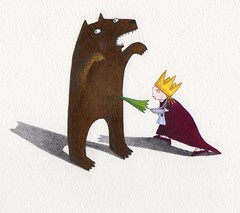 But although this is the first set of roughs, I’ve reworked and reworked a lot! We only have a small scanner so there’s bits missing off each side -but hopefully you get the gist! This is about half way through and the mermaid queen is trying to steal her jewels back, only to be surprised by the pirates! Quite pleased with my sword wielding pirates! 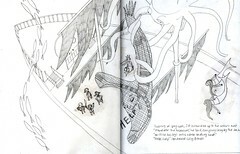 This is the following spread showing Sid the squid holding Lazy Bones and dangling him over the crows nest demanding the jewels. Its missing a bit in the middle of the spread so its disappearing into the gutter. 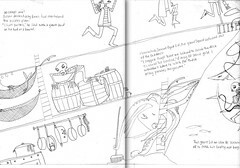 This spread leaps a few pages and shows the pirates having won the treasure, celebrating by having a party. Its missing a bit at each side. I’ve divided the page up to show more of the action, with text boxes at the top and bottom right. I’m particularly pleased with the Captains ‘Titanic’ moment! I have failed hugely with my blog so far, so this is my attempt at making more of an effort! 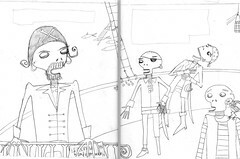 I’ve been working on roughs for ‘Captain Bones and the Mermaid Queen’. Its been a toughie but I am beginning to at last make headway. 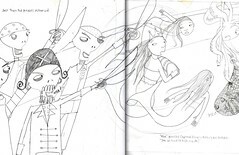 These are the first two spreads,showing just sections of them. I’ve done more than this- but I’m still tinkering.. I tend to do quite detailed roughs as I don’t want the publishers to get any surprises when they receive the artwork. I use concentrated watercolours and so its hard to make any changes once I’ve painted it-unless its a patch, which I’d rather not do unless I have to.